you are here: home » lifestyle » 7 Free Things To Do For Valentine’s Day! 7 Free Things To Do For Valentine’s Day! You had me at Hello. Truffles. Roses. Romantical Meal a Deux. Complicated Undergarments. Mmmm, not really. The best kind of love is free, unconditional, and exuberantly shared! It takes nothing more than a tittering of thought + a cup of consideration to show love, to yourself and those around you. Happy Valentine’s Day. Be sweet! you, too, sweets! sending you truckloads of choco love! 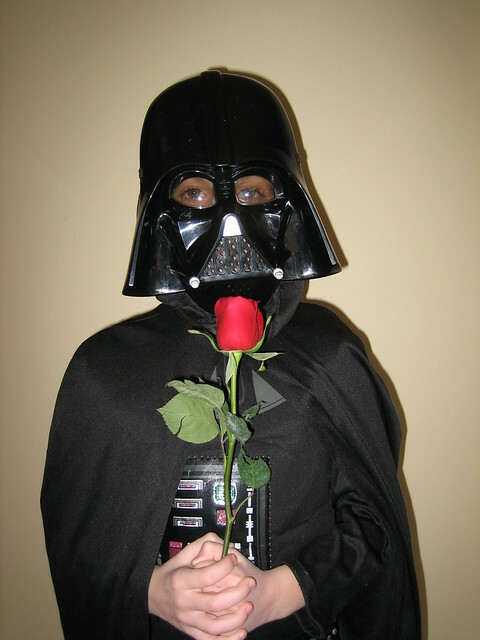 now, who would have thought Darth Vader to be a true romantic?! Thanks for sharing the PeachBerry Granita, totally making sweets for my sweet and Love the Gratitude list! We could all use one of those. Happy V-Day! #3 is actually what I decided to do :-)great minds think alike Lo….great minds.. Perfect! ;) Sweets for a sweetie. Happy Valentines Day! I had my sweetie give me poems read aloud for my birthday this year and it was great – he spent hours picking out poems for each day of the whole next week that represented the trajectory of our relationship. I will keep them always.